1 - 3pack/s $11.95 ea. 2 - 3pack/s $9.97 ea. 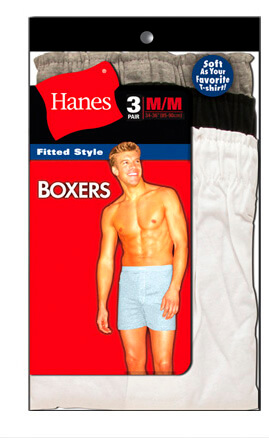 Hanes Soft 100% Cotton button fly knit boxers (sold in a package of 3 briefs) with ultra soft waistband that doesn't leave marks and button fly. Tagless - no more scratchy label. Great boxers in assorted colors by size. Available in three sizes: Medium 34-36, Large 38-40, and X-Large 42-44 for a perfect fit. Machine wash cold with like colors. Imported. This knit boxer was a favorite with our wear testers for the soft waistband (not covered), but very soft and very durable.